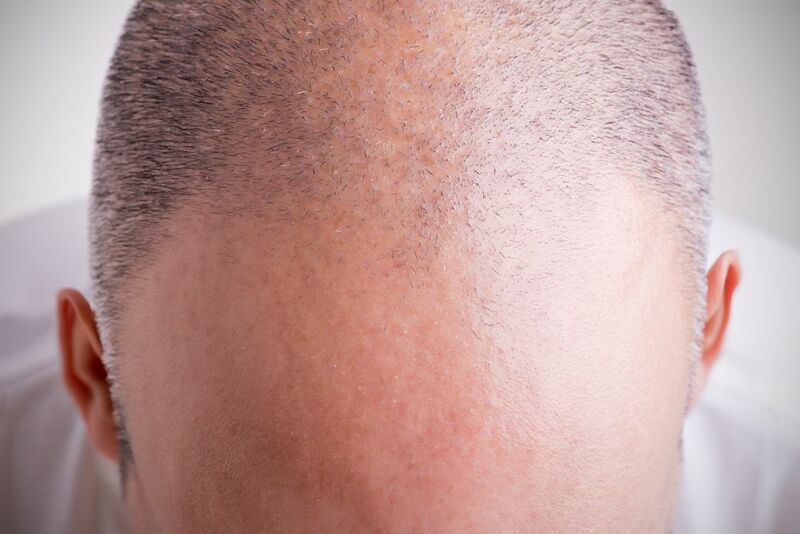 Patients with thinning hair can take advantage of hair transplants at our New York, NY practice. There are two primary types of hair transplants: follicular unit transplantation (FUT) and follicular unit extraction (FUE). These procedures have different candidacy requirements. Therefore, the most effective option for you will depend on your specific situation. What is the right level of pre-op baldness when it comes to hair transplants? Today, our team at True & Dorin will answer that question and explain a few factors that can affect your eligibility. This process involves harvesting a small, superficial strip of tissue from the sides or back of the head. The area is then stitched together. Your surgeon takes the donor strip and prepares it into refined skin grafts, which are then transplanted into the areas of deficiency. Once the new follicles attach, they will continue to grow for a lifetime. How Much Hair Is Necessary for FUT? Ideally, patients would have at least two months of hair growth in the area prior to their transplant surgery. This will ensure that the area where the strip was harvested can be easily concealed with the hair above and below the donor site. This procedure is not as invasive compared to FUT. To perform this treatment, your surgeon meticulously extracts follicular units one at a time, rather than harvesting an entire strip. As a result, no sutures are necessary during this treatment. How Much Hair is Necessary for FUE? In order to harvest the necessary follicles, a small area of the head must be shaved. However, the rest of the head does not need to be shaved, including the hairline. Can I Have a Hair Transplant if I’m Completely Bald? Many of our patients ask if they can receive a hair transplant if they are completely bald. The answer really depends on the quality of the donor supply. Located on the back of the head, the donor supply is the fringe of hair that remains. Patients with a decent supply are candidates. If there is insufficient donor supply, you may be better suited for another type of treatment. When determining your eligibility for a hair transplant, there are other factors to consider as well. For example, hair restoration is only appropriate for patients over the age of 18. While some young individuals may experience signs of thinning hair early on, the hair pattern may not be fully developed yet. Therefore, it is important to wait until you are older. In fact, the most ideal candidates are over the age of 30. Additionally, the pattern of baldness has a significant impact on your eligibility for hair transplantation. For example, if you have Diffuse Unpatterned Alopecia, that is, hair loss that is consistent across the entire scalp, then you are probably not a good candidate for this treatment. If you are interested in learning more about hair restoration, including hair transplants, schedule a consultation at our practice. Contact us online or call us at (212) 826-2525.